Artisan and Goldsmith Angela Morgan completed her jewellery design education at Haliburton School of the Arts, and has spent several years at the bench creating unique and wearable jewellery. Having always considered herself an artist, Angela was drawn to the fact that jewellery is a wearable art form that expresses both one's personality and daily emotions. She is a strong believer that artisan crafted jewellery should be well-loved and widely worn. In her work, she strives for the imperfect beauty that can result from the handmade jewellery process, proving that it is not a mass-produced item. 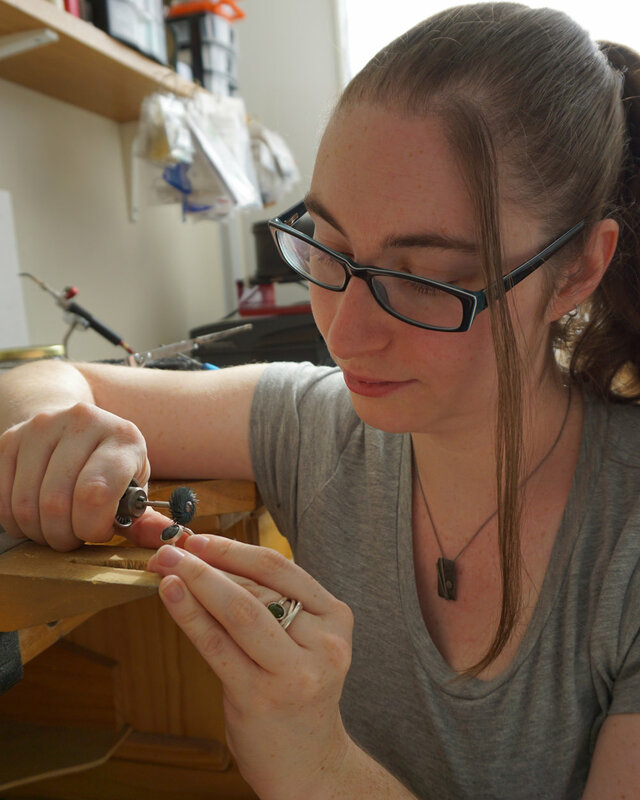 Angela thoroughly enjoys incorporating the challenges that she meets while manipulating the metals and stones into the finished jewellery art - there is much inspiration inside of her studio and through many of her organic creation processes. Her philosophy and goal is to strive to promote beauty and joy through meaningful adornment. "Argent Whimsy’s designs are playful, simple, and uniquely different. They have a style and feeling that will complement any outfit." The Argent Whimsy Jewellery style employs a mix of clean lines, soft curves, and organically formed textures. Fabrication of the pieces often require repeated application of heat and flame, in order to achieve the desired texture. There is an unpredictable beauty that results from this process, which Angela strives to capture. Often described as "delicate", Angela's pieces show great attention to detail, contrasting textured and patina’d surfaces with beautifully polished metal. She use sterling silver or gold as the base to showcase the precious and semi-precious gemstones, while the choice of texture, patina, and colours are deliberate in every piece, adding to the emotion and implied movement behind the designs. From unique pendants, to playful earrings, to bracelets that can be worn both at the office and for a night out on the town, Argent Whimsy Jewellery is certain to have something that will become a favourite in your own wardrobe. Founded in 2013 by artist Angela Morgan, Argent Whimsy is currently located in a private independent studio space, just steps from the harbour in beautiful Hamilton, Ontario. This small and intimate space means that every tool is within a quick arms-reach and promotes efficiency and creative alignment of all of her jewellery projects. All casting is now done on-site and Argent Whimsy is proud to offer all-Canadian sourced materials and findings. 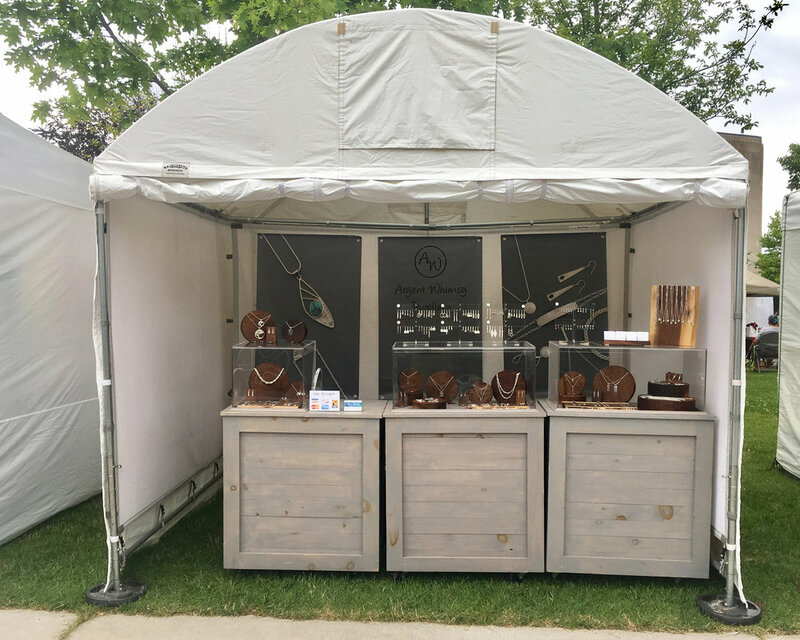 While Argent Whimsy Studios is not currently open to the public, all of her jewellery creations can be viewed by appointment & house-call, online, and at various craft shows and retail venues across Ontario.